Smile! October is National Dental Hygiene Month. Since 2009, the Wrigley Company and the American Dental Hygienists’ Association (ADHA) have been working together to organize National Dental Hygiene Month. Through this project, the two organizations hope to increase public awareness about the importance of maintaining good oral health through dental hygiene. It is also a great opportunity to recognize and celebrate the work of the 200,000 dental hygienists working in the United States, particularly when it comes to raising awareness of the proper dental care. 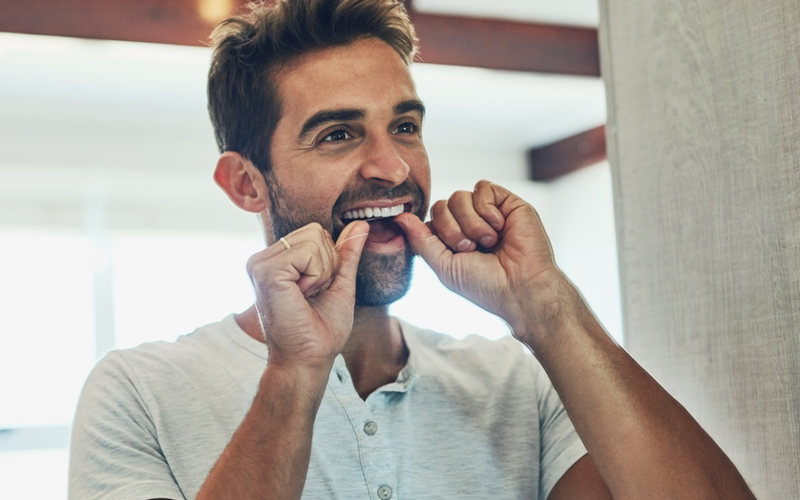 National Dental Hygiene Month focuses on the five routines that can help people maintain healthy and attractive smiles: brushing, flossing, rinsing, chewing, and regular dental cleanings. The American Dental Association recommends brushing your teeth twice a day, for two minutes, using a soft-bristled brush. Choose a brush with a size and shape that fits your hand, and allows you to reach all the areas of your mouth easily. Replace your toothbrush regularly to keep brushing effective. In order to brush your teeth efficiently, hold your brush at a 45-degree angle to your gums, and move the toothbrush back and forth gently across your teeth using short strokes. Be sure to brush the outer surfaces, chewing surfaces, and the inner surfaces of your teeth. Tilt the brush vertically and use up-and-down strokes to clean the inside surfaces of your front teeth. Brush your tongue to freshen up your breath and to remove the bacteria that can lead to gum disease and tooth decay. Floss at least once a day to maintain good oral hygiene and prevent dental problems, like cavities. Cleaning between your teeth can help remove stubborn plaque not removed by brushing. Left in place, this plaque can eventually harden into tartar, which can lead to gum disease and tooth decay. Rinsing with a dental mouthwash can help eliminate bacteria and other substances in your mouth that brushing and flossing cannot. Frequent rinsing can help reduce your risk of dental decay and infection. Try to avoid rinses with alcohol in them that can irritate your mouth. Chewing sugarless gum for 20 minutes following meals can help prevent tooth decay. The act of chewing increases the flow of saliva, which rinses away food and other debris. Saliva also neutralizes acids produced by bacteria in your mouth and distributes disease-fighting substances throughout your mouth. Chewing healthy, hard foods like apples and carrots will also help naturally clean your teeth. Regular dental cleanings can remove the plaque and tarter than lead to gum disease and tooth decay. Routine exams give your dentist an opportunity to spot signs of dental problems early when they respond best to treatment. Your dentist and dental hygienist can also provide more tips to help you avoid the consequences of bad dental hygiene, like bad breath and tooth decay. Throughout the day and night, bacteria and other substances create a film that covers your teeth and gums, known as plaque. Regular brushing and flossing removes this plaque before it becomes a problem. Left in place, however, and this plaque can harden into tartar that you cannot remove by simply brushing and flossing. Plaque can build up on your teeth and at the gum line, which causes irritation, inflammation, and easy bleeding. Pockets can develop between teeth and the gum, where bacteria and plaque can form and damage the tissues and bone that hold your teeth in place. Eventually, your teeth may loosen or even fall out. Poor dental hygiene can also lead to dental caries, also known as cavities. Bacteria can seep through the tiny pores of teeth to affect the dentin or pulp deep inside the tooth, which can cause the tooth to decay.